When I lined up the ink colors of Kristina Werner's color challenge on my worktable, I immediately thought of a sunrise/sunset. The colors are a dark red (Ruby Red), Cameo Coral, More Mustard, So Saffron, Baja Breeze and Whisper White - or equivalent colors in non-Stampin' Up! products. Surprisingly the red didn't show up that much in the finished product althought it really is there and the effect was a very soft sunrise. So I paired the image with Cameo Coral cardstock, So Saffron ribbon, and a Baja button. 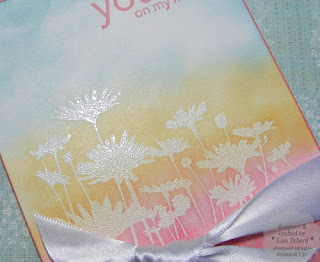 Typically I do this technique of embossing an image and then sponging on colors on plain white cardstock. For this one, I tried water color paper in the card at top. The results were very similiar. You get a little more texture showing through on the watercolor paper. 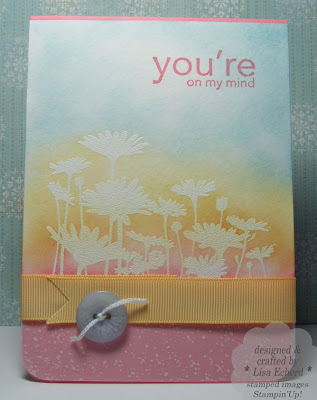 The bottom of the card is vellum stamped using Itty Bitty Backgrounds in Whisper White. Ink: Ruby Red, Cameo Coral, More Mustard, So Saffron, Baja Breeze and Whisper White; Coral Rose from Colorbox. Button and Ribbon are SU! also. Nice job. I really like the way you offset the button on the gross grain ribbon. Looks great. Gorgeous card, love this image - I wish we had access to it in the UK! WoW! What an amazing way to use all the colours from the Challenge! The daisies are so beautiful and such a pretty, soft background! Great work!